The frame widget is a bin that surrounds its child with a decorative frame and an optional label. If present, the label is drawn in a gap in the top side of the frame. The position of the label can be controlled with set_label_align. 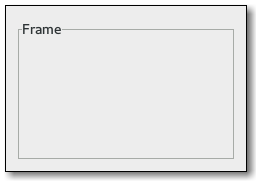 The GtkFrame implementation of the GtkBuildable interface supports placing a child in the label position by specifying “label” as the “type” attribute of a <child> element. A normal content child can be specified without specifying a <child> type attribute. ain CSS node named “frame” and a subnode named “border”. The “border” node is used to draw the visible border. You can set the appearance of the border using CSS properties like “border-style” on the “border” node. The border node can be given the style class “.flat”, which is used by themes to disable drawing of the border. To do this from code, call set_shadow_type with gtk_shadow_none to add the “.flat” class or any other shadow type to remove it. Creates a new Frame, with optional label label. If the frame’s label widget is a Label, returns the text in the label widget. Retrieves the X and Y alignment of the frame’s label. Retrieves the label widget for the frame. Retrieves the shadow type of the frame. Sets the alignment of the frame widget’s label. Sets the label_widget for the frame. Sets the shadow_type for this, i.